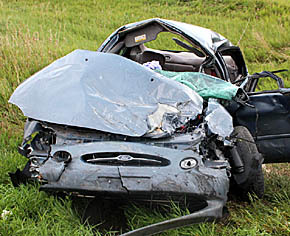 Jennifer Markvicka, 42, died after the 10:15 a.m. collision at the intersection of Highways 14 and 56 southeast of Albion. The eastbound car driven by Markvicka apparently failed to stop at a stop sign and struck the side of a southbound semi tractor-trailer driven by Billy Russell of Omaha. Russell was also transported to the Boone County Health Center, Albion, for treatment after the accident. Boone County Sheriff’s Office investigated the accident.